Quickly and easily connect SATA and/or IDE hard drives through USB 2.0. This USB 2.0 to IDE/SATA Adapter Cable connects any standard 2.5in or 3.5in SATA or IDE hard drive to a computer through USB 2.0. The adapter lets you connect a bare drive with no enclosure, saving time and hassle.The USB 2.0 SATA/IDE Adapter features LED indicators that allow you to easily monitor status and activity updates, and is designed for durability and reliability. 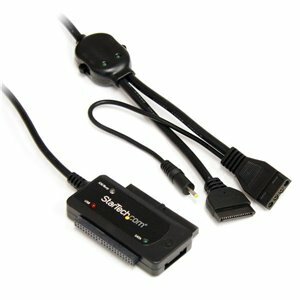 The USB 2.0 SATA/IDE Adapter features LED indicators that allow you to easily monitor status and activity updates. Designed for durability and reliability.